Now that I've officially heard back from everyone (the good news: they all said "yes! "), I'm so excited to share with you all exactly how I asked seven very special girls if they would stand up with me at our wedding. Even though our wedding is still more than 14 months from now I was itching to ask the girls right away. I wanted to do something cute and creative, and also give them a little something fun to open in the mail. So weeks ago while browsing for inspiration on one of the many wedding blogs I visit on a daily basis, I came across the cutest idea ever (that I could pull off from afar). Inspired by Anna of Rifle Paper Co. (my all-time favorite stationer/designer, whose work makes me smile every time I see it), I knew what I had to do. Before the reveal, let me just say that this was a love/hate project. I LOVED the idea and how it eventually turned out, but after finishing my first card, I sat there, overwhelmed at my large bridal party. You mean I have to make SEVEN of these??? Good grief. From start to finish, I completed the project in about four weeks. I'd sit down for an hour, cut out the paper doll chains, and then stop for a few days. Then I'd cut some dresses, maybe some hair, and then stop again for a few days. I could've completed them much more quickly, but I had plenty of time to get them done, so I just saved myself the stress. In the end, even though it was a little tedious, I absolutely adored how they turned out. And the overwhelming response from all my girls was that they loved them, too (In fact, one of the girls displayed them in her ultra-cute baby boutique, Tweed, and showed her customers all day... if you know Maggie, you know this is the highest form of flattery)! And what mattered most to me, aside from them all agreeing to be my 'maids, was giving them something to make the smile and get excited about the day. I made sure to make the top paper doll of each chain corresponded to whose card it was. Then, when they untied the twine and opened the paper doll chain, they got a sneak peak at all the other bridesmaids in the group! And here's the card I designed packaged underneath the paper-doll chain, specifying the girls' very difficult duties as my bridesmaids. I never thought I'd have such a large bridal party, but there's just no way I couldn't have all seven of these lovely ladies as my bridesmaids. Two I've been friends with since I was three years old. Two more have been my friends since middle school. Two others have been my friends since freshman year at college and one is my future sister-in-law! Maid and Matron of Honor duties are happily shared by both my friends of (gulp) 24 years. I am an incredibly lucky person to have such stellar people in my life, and that they'll all be up there with me as Eric and I tie the knot. What are some creative ideas you've seen for "Be my maid?" asks? I've seen an adorable box filled with dress ideas, pictures of the bride and the bridesmaids and fun keepsakes... but I'm pretty sure that would have cost me a fortune with shipping... I love any special thought that goes behind asking your 'maids! Hey you guys! Did you know today, February 28th is National Pancakes Day? I have no idea where all these "national food days" come from (it seems like it's either national cheeseburger day, national cupcake day or national bacon day at least three times a month), but it seems to me they're just excuses for eating some of the nation's favorite comfort foods (never have I heard of it being National Celery Day). While I didn't feast on flapjacks of my own this morning (fun fact: I usually eat my pancakes plain OR with chocolate chips if I'm feeling saucy. 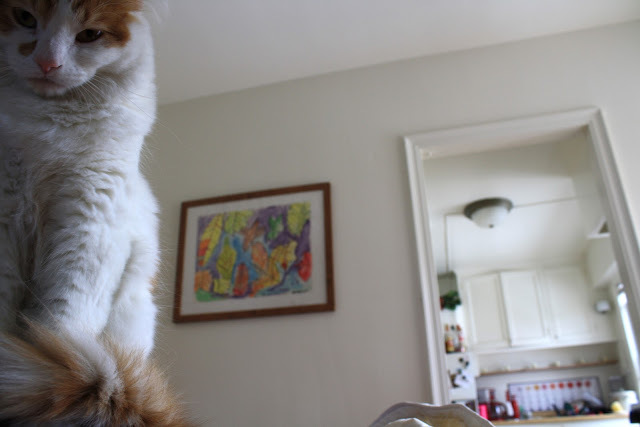 I think I've only had maple syrup on pancakes about three times in my life, much to Eric's embarrassment/dismay), I do have a very fluffy feline at home who couldn't be more excited there's a whole day dedicated just to his namesake. We thought of the name "Mr. Pancakes" long before we had a cat. 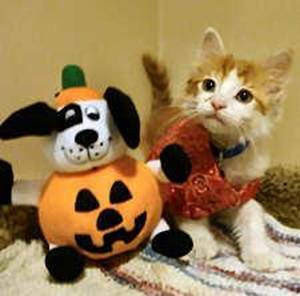 When we logged on to the Wisconsin Humane Society's web site one day and saw the above picture, we KNEW this had to be our little Mr. Pancakes. When we got to the humane society, imagine our surprise when his "name" there was already Mr. Goodbar! He's been a very formal fellow from the start. Mr. Pancakes is also quite the model. Almost every time he sees the camera out, he must get in front of it. He even makes sure to strike a pose (or 12) just so you can get all his best angles. He's such a diva. He also loves empty boxes. It doesn't matter if they're gigantic or only big enough to fit two paws in. No later than 15 seconds after we place an empty box on the floor, he's in it (or attempting to get in it). Perhaps Mr. Pancakes's most impressive quality is that he plays fetch. Just like a dog. And it's his favorite game. His favorite object to fetch is a rubber band (we've got plenty of them strewn about our house for impromptu fetch sessions). You throw it, he sprints over, and prances back to you with it dangling from his mouth before politely dropping it at your feet. You throw again. After about 10 minutes of fetch, he's completely pooped, and then finds a nice, cozy spot where he can curl up and look dead for a couple hours. So, in honor of National (Mr.) Pancakes Day, I plan on playing plenty of fetch with the little guy, and maybe he'll even get a couple of his favorite treats and a perfectly-sized cardboard box on his special day. Happy National Pancakes Day, everyone! There are more where these came from! To see everything I pin all week long, follow me on Pinterest! Well, it's official: On May 5th I'll be headed back to Kenosha for the Wisconsin half marathon for the second year in a row! I absolutely loved this race last year - the course is fast, pretty and who wouldn't love the post-race brats, beer and polka music? At the finish of last year's race, I felt strong and happier than I ever had in any other race I've run, despite missing a personal record (PR) by seven measly seconds. I also loved that I was able to see Eric cheering me on along the course three different times (in Chicago, I only saw him once! ), and each time I saw him I just got an incredibly boost of energy. He's already said he's looking forward to a doughnut and coffee at a little shop along the course while waiting for me to pass. Reach for the stars, Eric! So, now that I'm registered, training officially starts next week! Hello long runs and speed work (oh joy), goodbye P90X. I'm going to try my hardest to continue to get at least two days of strength training in a week, but sometimes training for a race doesn't allow for building fitness in other areas. Oh well, I am DETERMINED to get my PR that alluded me last year, in fact, I hope to crush it. But in the end, I really just hope I feel as great as I did after running the half last year; running 13.1 miles and feeling like you've got energy to spare is a mental win - and sometimes those are the ones I need the most. Are you signed up for any races this year? Running, biking, swimming.... maybe all three? What was your best race experience? Let me just start out by apologizing for this post title.... I'm so sorry you had to read that. And even sorrier I wrote it. If there's one thing Eric and I enjoy doing in regards to home decor, it's getting furniture on the cheap. If there are two things, it's getting furniture on the cheap and then hacking that furniture to make it a little more customized to "us." If there's a third thing (there's always a third thing), that would be turning someone else's trash into our treasure. Thankfully, a popular television show has reformed "dumpster diving" into "American picking." And that's exactly how our latest project began. Shortly after the new year, Eric noticed our neighbors across the street were tossing out a big wooden trunk. You already know about Eric's new-found obsessed with old boxes. It was just sitting there, by their recycling bin, teasing Eric through our front picture window. Realizing they were not at home, Eric took the opportunity to scamper across the street, pluck up the trunk and bring it back to our house a full 35 seconds before I witnessed them pulling into their driveway, right next to where the trunk used to sit. This would surely make for an awkward encounter and wouldn't exactly win us the "coolest neighbors on the block" award (though perhaps our obnoxious Christmas lights already knocked us out of the running for the title), but at least he got away with it by the skin of his teeth. Anyway, once the trunk was rightfully (I guess?) ours, what were we to do with it? We figured, in case we ever do become good friends with our neighbors, we should disguise the trunk as much as we possibly could. Eric got to work right away. First, he sanded down the trunk and primed it, as the best way to fool your neighbors into believing the trunk in your house was not once part of their garbage is by painting it a completely different color. In this instance, the color to mask the trunk was Behr's Mossy Green, which we initially bought months ago when planning to paint a dresser in the guest room, but later changed our minds. Two coats later, it was a nice, shiny change. But we knew it needed more. To give it a little lift, Eric picked up some wooden legs from Home Depot to attach to the bottom of the trunk. Then he stained them a deeper color to give them a rich finish. A big change, but once we brought it up to the guest room, where it will live, we agreed it was missing something... It was a lot of green on one piece of furniture, and it needed a little more detail. I scoured stores for pretty wrapping paper to cover the top, but couldn't find anything that would fit with the room's color and the bright green of the painted trunk. After sitting on the idea for a week or so, it finally popped into my head - a map! A map would look great adorning the "new" green trunk. 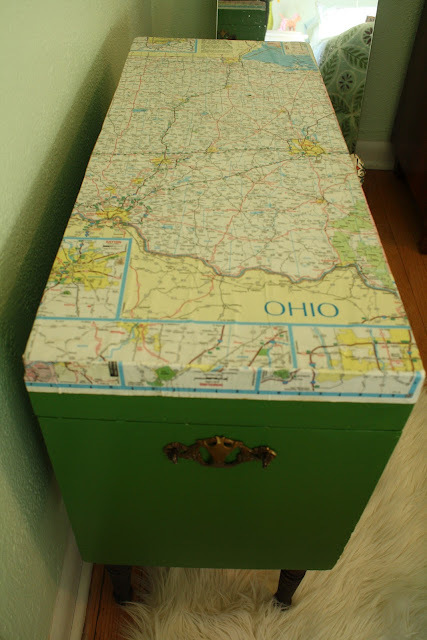 I just so happened to have a couple of old Ohio maps that, for whatever reason, were still stuffed in one of my car's side pockets nearly four years after I moved away, so I figured what better way to pay homage to my home state than to have a map of it plastered onto a piece of furniture in our house? I laid the map out on top of the trunk and measured where I'd need to cut. 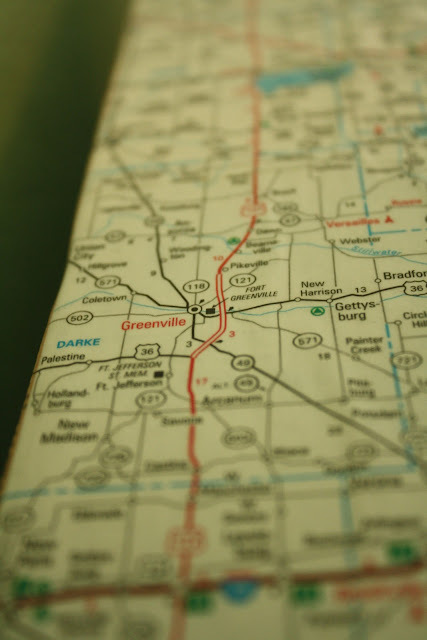 I wanted to fit all the places I lived in Ohio on the trunk, but alas, the distance between my hometown of Greenville and my collegiate town of Athens (Go Bobcats) were just too far apart. The eastern portion of Ohio had to be snipped from the trunk, as including my hometown (located on the west border of the state) was the most important place I wanted to include. Once I had the map cut to size, I worked on getting it adhered to the top of the trunk. This is where your best friend and mine (I'll fight you for its honor), Modge Podge, came into play. If you've never used Modge-Podge before, it's essentially a slightly-watered-down glue that's a great adhesive and sealant... especially if you're working with paper products. I simply added a medium layer of Modge Podge directly to the top of the trunk, lined up my map all straight, then added a couple of coats of Modge Podge directly on top of the map, making sure to flatten out any bubbles as I went. I also paid close attention to the edges of the map, and made sure they molded to the edges of the trunk to ensure clean lines. We also added a fun little knob to the lid of the trunk, which I picked up for $1 from a World Market store that was having a store-closing clear out months ago. Now, while I do like the changes we've made to it, I feel like there's still something missing.... I like it needs a little more. Something stenciled on the front? I'm not sure. But I'm still not 100% satisfied with it, even though the Ohio map on top did turn out really nicely. Heck, even a little bit of Kentucky and Michigan make an appearance! One thing's for sure, though, I'm fairly confident that if our across-the-street neighbors came over and happened to traipse into our gust room, they would never know that this bright-green trunk was once considered a piece of their garbage. Unless, of course, they begin reading this blog.